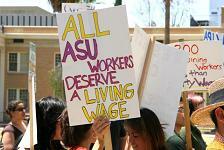 Campaign background: The ASU Living Wage Coalition (LWC) was started by members of the Campus Greens and the Young Democrats, two groups on campus at Arizona State. Students from both groups actively supported contracted construction workers on campus who went on strike during fall 2005. Now the LWC is working with the foodservice workers who work for Sodexho, one of the largest companies contracted to run college cafeterias and cafes. Ever since the workers began talking to representatives of the UNITE-HERE union, Sodexho has been intimidating workers, allegedly by forcing workers to watch anti-union videos. When many cafeteria workers were suddenly afraid of speaking with student activists they'd previously been friends with, students demanded an investigation, which administrators dropped soon after. The fact that ASU’s fourteen-year food service contract with Sodexho expires in July of 2007 motivated us to focus on winning a living wage and right-to-organize policy for foodservice workers, with the goal of setting a precedent for other contract negotiations. Up until now, contract bids were judged on two things: quality of the product and the price. Employment practices of contractors have never been a part of the decision making process. Our short-term strategy is to change that.